‘In order to be a good footballer, you must run swiftly and pass the ball accurately’. Wise words indeed – especially when one considers that they were uttered not by Jose Mourinho or Arsene Wenger, but by Kim Il Sung, Eternal Leader of the Democratic People’s Republic of North Korea (DPRK) in the 1960s. This tactical insight may not be earth-shattering in footballing terms, other than perhaps to the current England squad, but it was said at a time when football, for a brief moment at least, became a crucial focal point of Cold War international relations. For the 1966 World Cup, FIFA allocated just one place at the tournament for a team from either Africa, Asia and Oceania. The man in charge of FIFA was Sir Stanley Rous, an Englishman so conservative and autocratic that a favourite joke in football circles claimed that FIFA was run by three people: Sir, Stanley, and Rous. Rous’s decision predictably provoked a backlash, as sixteen countries announced that they would boycott the event. Only two nations remained: Australia and the communist DPRK. 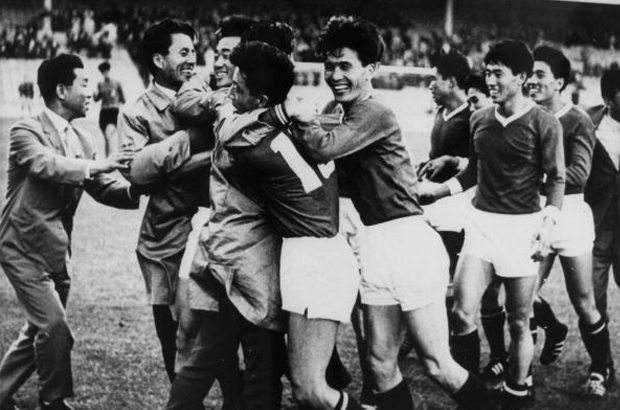 Thanks in part to Kim Il Sung’s tactical nous (at least according to defender Rim Jung Song) the North Koreans thrashed their opponents 9-2 in a two-match play-off held in Pnom-Penh in November 1965. With this victory, the North Koreans had, as British diplomat D. Timms put it at the time, ‘thoughtlessly’ qualified for the 1966 World Cup, and for the Foreign Office (FO) the tournament immediately became a diplomatic headache. Since the Korean War ended in 1953, Britain had officially refused recognise the communist DPRK as a legitimate nation state, and in the midst of Cold War tension could not afford to put any further pressure on its relationship with the United States by altering this position. Moving the tournament altogether was considered, though dismissed due to the ‘undesirable political repercussions’ it might provoke. Between them, the Football Association (FA) and the FO would somehow have to figure out how a team of eleven players representing a de facto enemy of the British state would be allowed to play – in England – in the most famous sporting event on the planet. Three main problems were identified with DPRK participation. The first concerned nomenclature: how could the press and public refer to a country that officially did not exist? This was easily solved – the team would drop the acronym and play under the name ‘North Korea’. The second was trickier. How would the ceremonial pageantry surrounding each game, capitalising on the spectacle by having the players paraded for royal personalities and other dignitaries, deal with the involvement of North Korean players? Could Her Majesty the Queen be permitted to appear in photographs with the squad? The FO decided not, but rather than attract attention to their diplomatic manoeuvring, decided to abandon any such interaction in all but two games: the opening match and the final. The former would be played between England and Uruguay, so there would be no issue. The FO, clearly believing that it knew a thing or two about football, gambled that the North Koreans were insufficiently talented to reach the final. Finally, the FO had to negotiate the messier issue of the signs and symbols of DPRK nationhood. The Department of Education and Science had spent £1,000 to have a set of sixteen flagpoles – one for the flag of each nation – installed at stadiums hosting matches during the tournament. Desperately, the FO tried to ensure the DPRK flag would not be hoisted, even trying at one point to push for a complicated compromise in which flags would be taken down as each team was eliminated, again in the hope that the North Koreans would go out early. The Department of Education and Science would not back down, however, and the FO had to grovel to the South Korean Ambassador, Hon Kon Lee, who was reportedly furious at the display of the DPRK flag in Middlesbrough, where DPRK games were played. It is interesting to note, however, that the FO was able to withdraw a set of commemorative stamps showing all sixteen flags. In other words, the display of the paraphernalia of nationhood was tolerated only when temporary and geographically specific. The FO also had better luck with pre-game music, successfully altering the original plan to have both nations’ anthems played at each match. Instead, this would only occur before the opening game and before the final. Once again, their faith was placed in a lack of North Korean footballing prowess. The North Korean players, for their part, did an awful lot to make the FO sweat. In the second game 19,000 fans at Middlesbrough’s Ayresome Park watched them defeat former world champions Italy 1-0 to qualify for the knockout stages. The magnitude of the result, and the skilful style of play exhibited by the North Koreans, earned them a cult following in the North East, and 1,000 Middlesbrough locals actually made the journey across the country to Liverpool see North Korea face Portugal in the quarter final. Thanks to the brilliance of Eusebio, however, the game was to be their last at the tournament. The 52,000 fans who packed into Goodison Park, though, and the many more who saw the highlights of the game on national television later that evening, surely all remember the DPRK as much more than a diplomatic conundrum. Diplomacy, it seems, can never quite contain the power of football. Keep tabs on the past.Sign up for our email alerts. Can I just say, what an interesting read that was. I loved this fascinating piece. It was rumoured at the time that the draw for the World Cup had been fixed so that North Korea played all their games in Middlesbrough. I now wonder whether that might have been true. Certainly, it was odd to have one team playing all their games at one ground and by the third match (not the second as your excellent article suggests) there was a head of steam building in Middlesbrough for North Korea. An interesting read and a reminder of how, even at the age of 13, I probably unwittingly willed the underdog to do well and now 50 years later, I'm pleased to read that the FO didn't like it up 'em!